Title rivals Cork and Dundalk face off at Oriel Park after a weekend which saw the gap between the two reduced to a solitary point. 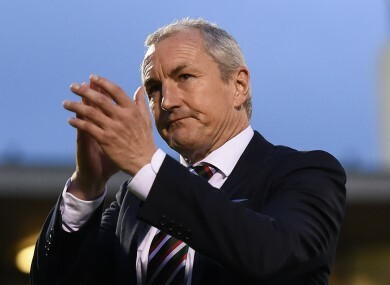 CORK CITY MANAGER John Caulfield is looking forward to a “massive game” against Dundalk as his side look to leapfrog the Premier Division champions into first place. The Leesiders’ 5-0 win over Galway United on Saturday, coupled with Dundalk’s surprise defeat to Sligo Rovers means that the gap between the top two has been reduced to a single point ahead of their meeting on Tuesday, with Cork boasting a superior goal difference. Cork have defeated Dundalk in each of their three meetings this season so far, but the Cork manager remains wary of a side he described as “the greatest team that’s ever played in the League of Ireland”. “People were saying that the league might be over but we felt that we were in with a chance,” Caulfield told eirSport. “We know from now on that we need to win games. It was a great display [against Galway]. We have to recover and move on to Tuesday. “I always felt that the league would go right to the wire. A lot of people didn’t think so, they thought it was over, but we felt that way. “We’ve got to keep our feet on the ground. Obviously we’re coming up against the greatest team that’s ever played in the League of Ireland – so we’re told – and we know it’s difficult, but we’re still in there. Email “'No one gave us a chance': Caulfield looking forward to 'massive game' against Dundalk”. Feedback on “'No one gave us a chance': Caulfield looking forward to 'massive game' against Dundalk”.